The 2018 NFL Draft is in the rear-view mirror now, but that means it’s time to start casting our eyes forward to the start of the season, and where better to begin than with an all-too-early look at the favorites for rookie of the year? We finally know now where each rookie has landed and what kind of scheme and situation they face, so we can at least apply some logic to the process. While we took a look at our top five candidates for Offensive rRookie of the Year earlier this week, we flip focus to defense today. 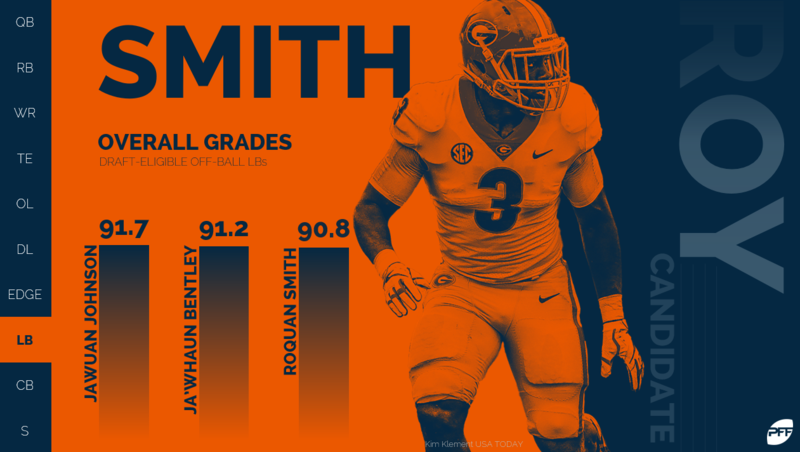 Roquan Smith was one of the best prospects in this draft, coming in at No. 7 on our final Big Board, and most importantly his skill set makes him the perfect linebacker for today’s league. Smith’s coverage skills are elite when it comes to college prospects and he has the ability to make plays in coverage that few NFL linebackers can. Crucially, he also has the range and instincts to make stops all over the field even if he isn’t a 250-pound player. He had the second most defensive stops (74) in all of college football last season and saw his PFF grade get better each season of his college career. In Chicago’s defense, Smith should have the freedom to impact all areas of the field and the coverage skills to make plays in front of a much improved secondary. If the big plays fall the right way he could make a big case for Defensive Rookie of the Year. There are few players that are more do-it-all than Derwin James, who somehow slipped all the way to No. 17 in the first round of the draft before being pounced upon by the Los Angeles Chargers. James has the skills to be a true matchup weapon on defense, in a league crying out for defensive counters to those offensive mismatch weapons that have taken over since the turn of the millennium. 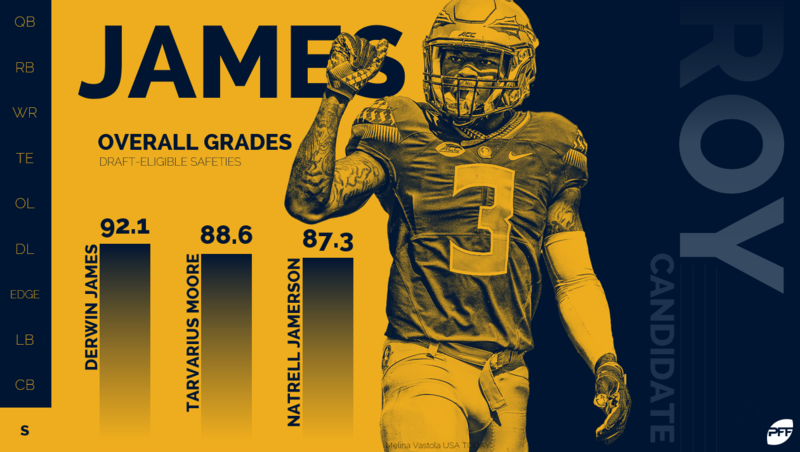 James was PFF’s highest graded safety in 2017, with a mark of 92.0, but to label him simply as a safety would be underselling his impact and versatility, which if used to its maximum, will be the thing that makes James a potential Defensive Rookie of the Year candidate. Tyrann Mathieu’s best trait was being deployed in a variety of different roles and impacting the game in a myriad of ways, and that’s the kind of thing the Chargers could do with James if they want to maximize what he can do on the field. At worst, he could become one of the few defenders capable of matching up 1-on-1 with elite receiving tight ends. It remains to be seen how Dallas will deploy their linebackers this season with Sean Lee and Jaylon Smith already in the building, but Leighton Vander Esch has a rare ability to just find the ball and get involved in plays. He led the nation in defensive stops in 2017 (76), his first full season of starting at Boise State. His ability to sift through trash and get to the ball is not dissimilar to Luke Kuechly in Carolina, and like Kuechly that extends to coverage, at least when it comes to the short game. Vander Esch was still good in coverage dropping away from the line of scrimmage, but it was the least comfortable area of his game – much like Kuechly in his rookie year – and if he develops that side in the NFL he could become a special player whose raw numbers are too large to ignore. Obviously, Maurice Hurst’s heart condition is the big X-factor in all of his evaluation. Many NFL teams took him off their boards entirely and some have been (anonymously) vocal in criticizing the Oakland Raiders for drafting him at all and exposing him to that kind of health risk. On the other hand, he has been cleared to play by more than one medical expert and if he does get on the field, there are few players that PFF expect to translate more successfully to the next level. 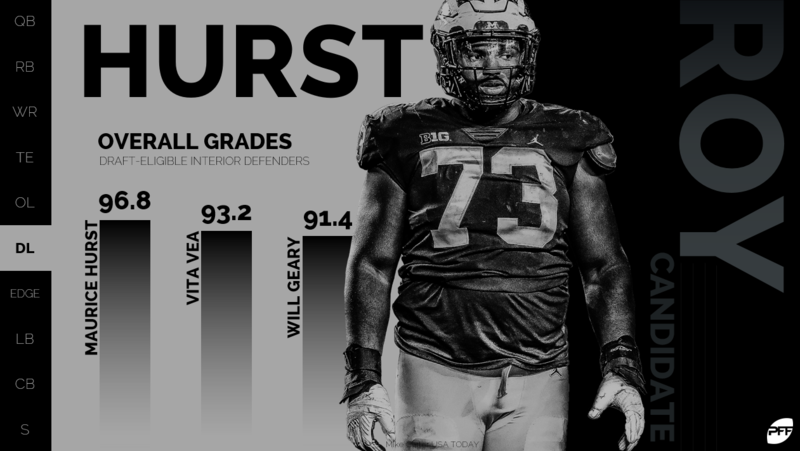 Hurst was the best graded interior linemen we have seen since we started grading college, and he did it across multiple seasons. While his tape is not perfect, it is in that rarified air that has seen seamless college-to-pro transitions from the likes of Joey Bosa and Myles Garrett. Bosa in particular saw his tape nitpicked in a similar way to some reports surrounding Hurst, but the grading and tape spoke for itself once he got the opportunity. Hurst had 49 total pressures in 2017 and 38 defensive stops. If the Raiders are right about his medical capacity to play, he remains one of the best prospects in this draft. A defensive back’s chances of winning rookie of the year tend to revolve more around the big plays he will make than they do around his overall level of play. Josh Jackson may not have the most complete game of this defensive back class, but he made more plays on the ball than anyone last season. He was the second-most targeted corner in the nation (89), and that enabled him to come away with eight interceptions and a monstrous 17 pass breakups, meaning he broke up a pass on 28 percent of the targets that arrived in his coverage, despite being a relatively young player at the position having arrived at Iowa as a wide receiver. Jackson will need to earn a role in Green Bay’s secondary, but there is no reason that can’t happen given the players ahead of him on the depth chart, and if he does, he has the ball skills to be able to notch an eye-catching number of interceptions, which immediately catapults him into rookie of the year conversations.